کنوانسیون میراث جهانی در سال ۱۹۷۲ برای طراحی و مدیریت سایت‌های میراث جهانی توسط سازمان ملل متحد تأسیس شد. با توجه به ماده ۱۱٫۴ کنوانسیون، یونسکو، میراثی که نیاز به محافظت دارند یا برای آن‌ها درخواست کمک شده در فهرست میراث جهانی در معرض خطر قرار دارند. این اقدام برای افزایش آگاهی بین‌المللی به تهدیدها و تشویق به اقدامات خنثی‌کننده در نظر گرفته شده‌است. در مورد سایت‌های طبیعی، خطرات عبارتند از:کاهش جدی در جمعیت گونه‌های در معرض خطر یا از بین رفتن زیبایی‌های طبیعی یا فعالیت‌هایی مانند قطع درختان، آلودگی٬استخراج، کشاورزی موجب نابودی آن محیط می‌شود. در مورد سایت‌های خطرات عبارتند از:از بین رفتن ساختار و مواد ساخته شده از آن از دست دادن اصالت تاریخی. از جمله خطرات برای هر دو سایت‌های فرهنگی و طبیعی، شامل طرح‌های توسعه، درگیری‌های مسلحانه، سیستم‌های مدیریت ناکافی یا تغییر در وضعیت حفاظتی است. در مورد سایت‌های فرهنگی تغییرات تدریجی به دلیل زمین‌شناسی، آب و هوا یا محیط زیست نیز می‌تواند خطرات بالقوه باشد. قبل از اینکه میراث در فهرست میراث جهانی در معرض خطر قرار گیرد وضعیت آن بررسی شده و برنامه‌هایی برای بازسازی و اصلاح آن با همکاری دولت عضو صورت می‌گیرد. پس از اجرای برنامه توسط دولت و بررسی سالانه توسط کمیته یونسکو ممکن از این فهرست خارج شوند. دلیل: تهدیدی که باعث شده یونسکو اثر را در فهرست میراث جهانی در معرض خطر جای دهد. *در کنار مرزهای ملی قرار دارند. میراث‌هایی که قبلاً در فهرست خطر قرار داشته‌اند. ↑ اورشلیم توسط یونسکو در منطقه خاصی ذکر نشده و فقط واژه اورشلیم نوشته شده. ↑ Site proposed by Jordan. UNESCO has stated that "In line with relevant UN resolutions, بیت‌المقدس شرقی remains part of the occupied Palestinian territory, and the status of Jerusalem must be resolved in permanent status negotiations between Israel and the Palestinians." "World Heritage in Danger: A compendium of key decisions on the conservation of natural World Heritage properties via the List of World Heritage in Danger" (PDF). Gland, Switzerland: International Union for Conservation of Nature. 2009. Retrieved 3 September 2011. Timothy, Dallen J.; Nyaupane, Gyan P. (2009). Cultural heritage and tourism in the developing world: a regional perspective. Contemporary geographies of leisure, tourism and mobility. 10 (illustrated ed.). گروه تیلور و فرانسیس. ISBN 978-0-415-77622-6. Retrieved 3 September 2011. ↑ "Convention concerning the protection of the World Cultural and Natural Heritage" (PDF). یونسکو. p. ۶. Retrieved 10 December 2010. ↑ "List of World Heritage in Danger". UNESCO. Retrieved 10 December 2010. ↑ ۳٫۰ ۳٫۱ "Operational Guidelines for the Implementation of the World Heritage Convention" (PDF). UNESCO. January 2008. Retrieved 10 December 2010. ↑ "Abu Mena". UNESCO. Retrieved 28 May 2010. ↑ "Abu Mena–Threats to the Site (2001)". UNESCO. Retrieved 27 August 2010. ↑ "Air and Ténéré Natural Reserves". UNESCO. Retrieved 28 May 2010. ↑ "Ancient City of Aleppo". یونسکو. Retrieved 17 Aug 2011. ↑ "Ancient City of Bosra". یونسکو. Retrieved 17 Aug 2011. ↑ "Ancient City of Damascus". یونسکو. Retrieved 17 Aug 2011. ↑ "Ancient Villages of Northern Syria". یونسکو. Retrieved 17 Aug 2011. ↑ "Archaeological Site of Cyrene". UNESCO. Retrieved 17 July 2016. ↑ ۱۵٫۰ ۱۵٫۱ ۱۵٫۲ ۱۵٫۳ ۱۵٫۴ "Libya's five World Heritage sites put on List of World Heritage in Danger". UNESCO. 13 July 2016. Retrieved 17 July 2016. ↑ "Archaeological Site of Leptis Magna". UNESCO. Retrieved 17 July 2016. ↑ "Archaeological Site of Sabratha". UNESCO. Retrieved 17 July 2016. ↑ "Ashur (Qal'at Sherqat)". UNESCO. Retrieved 28 May 2010. ↑ "Belize Barrier Reef Reserve System". UNESCO. Retrieved 28 May 2010. ↑ "Chan Chan Archaeological Zone". UNESCO. Retrieved 28 May 2010. ↑ "World Heritage Committee: Tenth session" (PDF). UNESCO. p. 6. Retrieved 26 June 2011. ↑ "Birthplace of Jesus: Church of the Nativity and the Pilgrimage Route, Bethlehem". UNESCO. Retrieved 30 June 2012. ↑ "Church of the Nativity and the Pilgrimage Route in Bethlehem, Palestine, inscribed on UNESCO World Heritage List along with sites from Israel, Palau, Indonesia and Morocco". UNESCO. Retrieved 30 June 2012. ↑ "Coro and its Port". UNESCO. Retrieved 28 May 2010. ↑ "Crac des Chevaliers and Qal'at Salah El-Din". یونسکو. Retrieved 17 Aug 2011. ↑ "Cultural Landscape and Archaeological Remains of the Bamiyan Valley". UNESCO. Retrieved 28 May 2010. ↑ World Heritage Committee. "World Heritage Committee inscribes East Rennell on the List of World Heritage in Danger". United Nations Educational, Scientific and Cultural Organization. Retrieved 2013-08-13. ↑ "Everglades National Park". UNESCO. Retrieved 28 May 2010. ↑ "World Heritage Committee: Seventeenth session" (PDF). UNESCO. pp. 20–21. Retrieved 26 June 2011. ↑ "Fortifications on the Caribbean Side of Panama: Portobelo-San Lorenzo". UNESCO. Retrieved 27 October 2012. ↑ "Panamanian fortifications inscribed on List of World Heritage in Danger". UNESCO. Retrieved 27 October 2012. ↑ "Garamba National Park". UNESCO. Retrieved 28 May 2010. ↑ World Heritage Committee. "The Iraqi site of Hatra added to the List of World Heritage in Danger". United Nations Educational, Scientific and Cultural Organization. Retrieved 2015-07-14. ↑ "World Heritage Committee inscribes new site and approves extension of existing site on UNESCO's World Heritage List". UNESCO. Retrieved 7 July 2017. ↑ "Historic Centre of Shakhrisyabz". UNESCO. Retrieved 17 July 2016. ↑ "Historic Centre of Shakhrisyabz, Uzbekistan, added to List of World Heritage in Danger". UNESCO. 13 July 2016. Retrieved 17 July 2016. ↑ "Historic Centre of Vienna inscribed on List of World Heritage in Danger". UNESCO. Retrieved 6 July 2017. ↑ "Historic Town of Zabid". UNESCO. Retrieved 3 December 2010. ↑ "Humberstone and Santa Laura Saltpeter Works". UNESCO. Retrieved 28 May 2010. ↑ "Kahuzi-Biega National Park". UNESCO. Retrieved 28 May 2010. ↑ "Liverpool – Maritime Mercantile City". UNESCO. Retrieved 27 October 2012. ↑ "World Heritage Committee places Liverpool on List of World Heritage in Danger". UNESCO. Retrieved 27 October 2012. ↑ "Manovo-Gounda St Floris National Park". UNESCO. Retrieved 28 May 2010. ↑ "Minaret and Archaeological Remains of Jam". UNESCO. Retrieved 28 May 2010. ↑ "World Heritage Committee: Twenty-sixth session" (PDF). UNESCO. p. 55. Retrieved 26 June 2011. 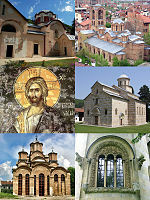 ↑ "Medieval Monuments in Kosovo". UNESCO. Retrieved 3 December 2010. ↑ "Mount Nimba Strict Nature Reserve". UNESCO. Retrieved 28 May 2010. ↑ "Nan Madol: Ceremonial Centre of Eastern Micronesia". UNESCO. Retrieved 18 July 2016. ↑ "Four sites inscribed on UNESCO's World Heritage List". UNESCO. 15 July 2016. Retrieved 18 July 2016. ↑ "Niokolo-Koba National Park". UNESCO. Retrieved 28 May 2010. ↑ "Okapi Wildlife Reserve". UNESCO. Retrieved 28 May 2010. ↑ "Old City of Jerusalem and its Walls". UNESCO. Retrieved 28 May 2010. ↑ "World Heritage Committee: Sixth session" (PDF). UNESCO. pp. 10–12. Retrieved 26 June 2011. ↑ "UNESCO replies to allegations". UNESCO. 15 July 2011. Retrieved 20 October 2011. ↑ ۷۰٫۰ ۷۰٫۱ World Heritage Committee. "Yemen's Old City of Sana'a and Old Walled City of Shibam added to List of World Heritage in Danger". United Nations Educational, Scientific and Cultural Organization. Retrieved 2015-07-15. ↑ "Old Town of Ghadamès". UNESCO. Retrieved 17 July 2016. ↑ "Old Towns of Djenné". UNESCO. Retrieved 17 July 2016. ↑ "Mali's Old Towns of Djenné on List of World Heritage in Danger". UNESCO. 13 July 2016. Retrieved 17 July 2016. ↑ "Palestine: Land of Olives and Vines – Cultural Landscape of Southern Jerusalem, Battir". UNESCO. Retrieved 25 February 2015. ↑ "Palestine: Land of Olives and Vines - Cultural Landscape of Southern Jerusalem, Battir, inscribed on World Heritage List and on List of World Heritage in Danger". UNESCO. Retrieved 25 February 2015. ↑ "Rainforests of the Atsinanana". UNESCO. Archived from the original on 27 August 2011. Retrieved 28 May 2010. ↑ "Río Plátano Biosphere Reserve". UNESCO. Retrieved 25 June 2011. ↑ "Rock-Art Sites of Tadrart Acacus". UNESCO. Retrieved 17 July 2016. ↑ "Salonga National Park". UNESCO. Retrieved 28 May 2010. ↑ "Samarra Archaeological City". UNESCO. Retrieved 28 May 2010. ↑ "Site of Palmyra". یونسکو. Retrieved 17 Aug 2011. ↑ "Timbuktu". UNESCO. Retrieved 27 October 2012. ↑ ۸۸٫۰ ۸۸٫۱ "Heritage sites in northern Mali placed on List of World Heritage in Danger". UNESCO. Retrieved 27 October 2012. ↑ "Tomb of Askia". UNESCO. Retrieved 27 October 2012. ↑ "Tombs of Buganda Kings at Kasubi". UNESCO. Retrieved 28 May 2010. ↑ "Tropical Rainforest Heritage of Sumatra". UNESCO. Retrieved 25 June 2011. ↑ "Danger listing for Indonesia's Tropical Rainforest Heritage of Sumatra". UNESCO. Retrieved 26 July 2011. ↑ "Virunga National Park". UNESCO. Retrieved 28 May 2010. ↑ "World Heritage Committee: Eighteenth session" (PDF). UNESCO. pp. 21, 51. Retrieved 26 June 2011. ↑ "Angkor". یونسکو. Retrieved 28 May 2010. ↑ "Bahla Fort". یونسکو. Retrieved 26 June 2010. ↑ "World Heritage Committee: Twelfth session" (PDF). UNESCO. p. ۱۹. Retrieved 28 May 2010. ↑ "World Heritage Committee: Eleventh session" (PDF). UNESCO. p. ۷. Retrieved 26 June 2011. ↑ "Butrint". یونسکو. Retrieved 26 June 2010. ↑ "Cologne Cathedral". یونسکو. Retrieved 26 June 2011. ↑ "Djoudj National Bird Sanctuary". یونسکو. Retrieved 26 June 2011. ↑ "World Heritage Committee: Twelfth session" (PDF). UNESCO. pp. ۷, ۱۶. Retrieved 26 June 2011. ↑ "Dresden Elbe Valley". یونسکو. Retrieved 26 June 2011. ↑ "Dubrovnik". یونسکو. Retrieved 26 June 2011. ↑ "World Heritage Committee: Fifteenth session" (PDF). UNESCO. p. ۳۱. Retrieved 26 June 2011. ↑ "World Heritage Committee: Twenty-second session" (PDF). UNESCO. pp. ۱۲–۱۳. Retrieved 26 June 2011. ↑ "Galápagos Islands". یونسکو. Retrieved 26 June 2011. ↑ "Group of Monuments at Hampi". یونسکو. Retrieved 26 June 2011. ↑ "Ichkeul National Park". یونسکو. Retrieved 26 June 2011. ↑ "Iguaçu National Park". یونسکو. Retrieved 26 June 2011. ↑ "Kathmandu Valley". یونسکو. Retrieved 26 June 2011. ↑ "Natural and Culturo-Historical Region of Kotor". یونسکو. Retrieved 26 June 2011. ↑ "World Heritage Committee: Third session" (PDF). UNESCO. p. ۱۳. Retrieved 26 June 2011. ↑ "Manas Wildlife Sanctuary". یونسکو. Retrieved 28 May 2010. ↑ "Successful preservation of India's Manas Wildlife Sanctuary enables withdrawal from the List of World Heritage in Danger". یونسکو. Retrieved 28 May 2010. ↑ "World Heritage Committee: Eighth session" (PDF). UNESCO. p. ۱۸. Retrieved 26 June 2011. ↑ "Ngorongoro Conservation Area". یونسکو. Retrieved 26 June 2011. ↑ ۱۴۲٫۰ ۱۴۲٫۱ "World Heritage Committee: Thirteenth session" (PDF). UNESCO. p. ۱۴. Retrieved 26 June 2011. ↑ "Plitvice Lakes National Park". یونسکو. Retrieved 26 June 2011. ↑ "Royal Palaces of Abomey". UNESCO. Retrieved 26 June 2011. ↑ "Royal Palaces of Abomey: Advisory Body Evaluation" (PDF). یونسکو. Retrieved 26 June 2011. ↑ "World Heritage Committee: Ninth session" (PDF). UNESCO. p. ۷. Retrieved 26 July 2011. ↑ "Rwenzori Mountains National Park". یونسکو. Retrieved 26 June 2011. ↑ "Sangay National Park". یونسکو. Retrieved 26 June 2011. ↑ "Srebarna Nature Reserve". یونسکو. Retrieved 26 June 2011. ↑ "Timbuktu". یونسکو. Retrieved 26 June 2011. ↑ "World Heritage Committee: Fourteenth session" (PDF). UNESCO. p. ۸. Retrieved 26 June 2011. ↑ "Tipasa". یونسکو. Retrieved 26 June 2011. ↑ "World Heritage Committee: Twenty-sixth session" (PDF). UNESCO. pp. ۳۶–۳۷. Retrieved 26 June 2011. ↑ "Wieliczka Salt Mine". یونسکو. Retrieved 26 June 2011. ↑ "World Heritage Committee: Twenty-second session" (PDF). UNESCO. p. ۱۳. Retrieved 26 June 2011. ↑ "Yellowstone National Park". یونسکو. Retrieved 26 June 2011. ↑ "World Heritage Committee: Nineteenth session" (PDF). UNESCO. pp. ۱۸–۱۹. Retrieved 26 June 2011. این صفحه آخرین‌بار در ‏۱۲ آوریل ۲۰۱۹ ساعت ‏۱۱:۵۸ ویرایش شده‌است.